Hey, everyone! Osama Bin Laden's corporate website expires on 9-11-01, and it's up for sale on eBay. 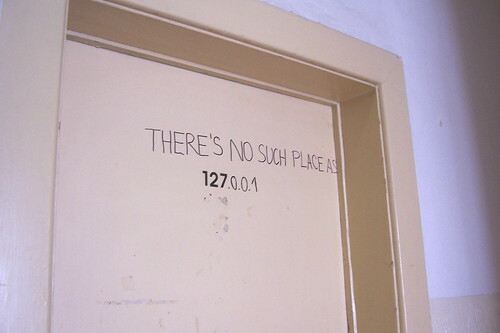 Boing Boing reader Dave Kha says, "While staying at a hostel in Prague I noticed this graffiti on one of the doors. I'm not sure if they're just taking the old "there's no place like home" joke and mistranslating it, or making a statement about the life of a wanderer." Moment of tabloid video zen: OJ Simpson (who's since been arrested) leaves a Las Vegas wedding where he reportedly served as best man -- on the way out, he's singing "If I only Had a Brain," from the Wizard of Oz. Some bystanderdude yells, "Hey, I got a brain!" Video Link. Steve Wozniak attended the Emmys tonight as the date of comedienne Kathy Griffin. Every phrase that appeared on Judah Friedlander's trucker hats from season one of 30 Rock. Sometimes, cybersquatting does not pay. A Las Vegas man faces about 20 years in prison after pleading guilty to wire fraud for impersonating an intellectual property lawyer and threatening lawsuits against the owners of Internet domain names. Bill Dube, inventor of the electric 'KillaCycle' motorcycle, crashed while demoing a burnout at Wired NextFest. The accident takes place about 70% of the way through the video at this link. Over at StreetTech, BB pal Gareth Branwyn has a neat post up today on a tribe of Steampunk bellydancers. Gareth says, "I especially like how the belt apparently says 'Not Yours.' Gotcha." Link. In this very odd YouTube video, worshippers at a Syrian mosque witness what they believe to be a holy miracle (the details are in the video description). Everyone holds their cellphones up in the air, hoping to phonecam video the sacred apparition.